Evil nannies that are determined to harm the innocent children they care for have become a popular recurring menace in many horror films over the years and last week one of the best nasty nanny movies was finally released on DVD for the first time. 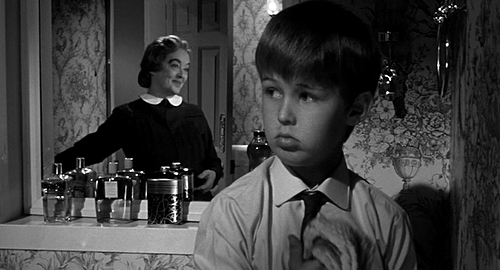 I originally saw Seth Holt’s chilling British thriller The Nanny (1965) when I was just a kid and it terrified me. I haven’t seen the film in its entirety in many years so I was afraid it wouldn’t live up to my fond memories of first watching it but The Nanny managed to exceed my expectations. The great thrillers Hammer produced during the sixties and seventies are often overlooked by critics since they don’t contain vampires, werewolves or any mad doctors but many of them are just as good or better than many of the monster movies the studio made. Great Hammer thrillers such as Freddie Francis’ Paranoiac (1963) and Peter Collinson’s Straight on Till Morning (1972) are some of my favorite Hammer films and The Nanny is another one of the studio’s best and most unusual efforts. The film stars the late great actress Bette Davis whose 100th birthday was recently celebrated by 20th Century Fox with a wonderful DVD set titled Bette Davis Centenary Celebration Collection, which includes The Nanny as well as four other Davis films. Bette Davis isn’t a name that most film fans associate with Hammer Studios but the actress made two films for Hammer during the sixties. The first one was The Nanny, which she starred in after filming two successful gothic thrillers in Hollywood (What Ever Happened to Baby Jane? and Hush… Hush, Sweet Charlotte) and afterward she appeared in Hammer’s black comedy The Anniversary (1968), which was directed by the talented Roy Ward Baker. 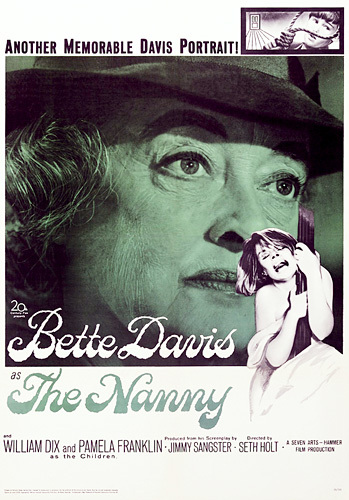 In The Nanny Bette Davis gives one of her most remarkable and nuanced performances as a dutiful servant of an upper class British family who has spent her entire life caring for the children of wealthy individuals and neglecting herself. As the film opens we discover that the family Davis’ character currently works for has lost their little girl in a horrible accident. They blame their precocious 10-year old son Joey (William Dix) for her accidental drowning and they’re struggling to deal with his eminent return home after the boy has spent two years away at a juvenile psychiatric facility for disturbed children. When Joey’s father (James Villiers) and the nanny arrive at the school to take Joey home, the audience is introduced to the boy in a beautifully shot but rather disturbing scene that’s reminiscent of Bud Cort’s mock suicide in the unforgettable opening of Harold and Maude made six years later. Joey’s dark sense of humor is clearly troubling to the adults around him and it might seem strange that a 10-year-old would be preoccupied with death. But when a child comes face to face with mortality at an early age it’s not unusual for them to feel the urge to act out in various ways. Before the boy leaves the school a doctor tells Joey’s father that he has developed a strange aversion to middle-aged females and on the ride home Joey makes it clear that he doesn’t like or trust his middle-aged nanny. Since the nanny is played brilliantly by Bette Davis it’s not hard to understand why she might make the boy uncomfortable. Davis was an unsettling presence in horror films in the sixties and she easily generates a kind of dread and sense of unease when she’s on screen. With a simple raise of her thick arched eyebrow she can send chills down your spine. Young Joey is so frightened by her that he immediately moves into a room with a window near a fire escape so he can quickly get in an out of his family’s luxurious apartment if the need arises. He also refuses to eat the food that his nanny prepares for him and he won’t take a bath until his mother (Wendy Craig) makes the nanny promise to stay out of the bathroom. His gruff father and emotionally unstable mother become increasingly frustrated by their son’s behavior and wonder if they should have kept him locked up. The nanny seems to come to the boy’s defense at first but as the film unfolds she also turns on Joey and the audience is left to wonder who is to blame for the boy’s seemingly erratic behavior. Is the boy’s paranoia justified? Or should the family have kept little Joey locked away forever? After Joey’s father is forced to leave home on business, the boy is left alone with his mother and nanny who have clearly developed an odd sort of codependent relationship over the years. The nanny has been with the family for a very long time and also took care of Joey’s mother when she was a young girl. 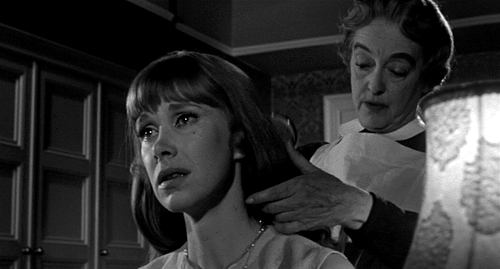 Joey’s mother is played wonderfully by the British actress Wendy Craig and it’s hard not to sympathize with her since she’s clearly suffering a deep depression following the unexpected death of her young daughter. As the perfect upper class family life she has long imagined for herself begins to unravel all around her, she regresses to a child-like state herself and the nanny is forced to brush her hair and even feed her. When she suddenly falls ill due to food poisoning and must be taken to the hospital, all fingers point to Joey as being the culprit but Joey blames the nanny. He later confesses to his cute teenage neighbor (Pamela Franklin) that he believes the nanny also killed his sister and is now trying to kill him as well. Joey’s accusations are hard to ignore and it’s not much of a surprise when the audience discovers that the nanny is the real source of horror in the film even if a few minor red herrings attempt to focus the audiences attention on the troubled young boy. What is surprising is the incredibly creative way director Seth Holt chose to shot the film and his wonderful use of flashbacks to show the events as they originally happened. The director also creates some truly terrifying moments in the movie such as when Joey’s aunt (Jill Bennett) who suffers from a terrible heart condition spots Davis standing next to the boy’s bedroom door with a pillow in her hand. Dear old nanny intends to suffocate the child in his sleep but she sweetly tells Joey’s aunt that she is only trying to make the boy more comfortable by bringing him another pillow. 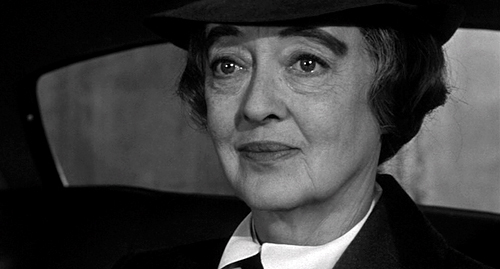 Bette Davis is really remarkable in The Nanny and her understated performance in the film often stands out in stark contrast to her other popular roles in horror films from the same period. Even though the relationship between director Seth Holt and Bette Davis was problematic on the set by all accounts, Davis did manage to follow the director’s recommendation to play the role extremely low-key and internalize aspects of her character that could have easily boiled over the top and found their way onto the screen. The young actor William Dix is also extremely good as Joey. I’m personally very critical of child actors and I often find them too mannered and unbelievable in their roles. But young Dix brings a realism to his role as Joey in The Nanny that is really remarkable at times and he seems to understand his character in ways that would completely escape many experienced adult actors. The film’s script was written by Hammer luminary Jimmy Sangster and based on a book by author Marryam Modell (using the pseudonym Evelyn Piper) who also wrote Bunny Lake Is Missing, which was adapted into another terrific film by Otto Preminger the same year. The Nanny and Bunny Lake is Missing share somewhat similar themes. Both stories feature children in peril and in order to save them someone must try and convince disbelieving authority figures that a child is in danger or being harmed. I don’t know if Marryam Modell had any experience with child abuse herself, but there is an underlying attitude in both of her stories that suggests she might have. The talented director Seth Holt began his career co-directing and editing films for Britain’s Ealing Studios, including the wonderful 1945 horror anthology Dead of Night. Holt is mostly known for the entertaining thrillers he made with Hammer Studios and his name rarely comes up when critics are talking about the British New Wave and various kitchen sink dramas but it should. Holt’s first film is a remarkable crime drama called Nowhere to Go that was co-written by Kenneth Tynan who helped usher in the era of “angry young men” as an important theater critic. Nowhere to Go is a stylish modern crime film with a great jazz score by Dizzy Reece and a bleak ending that’s somewhat reminiscent of Godard’s Breathless (1960). It’s an important film in the evolution of British cinema but it’s often overlooked and deserves a wider audience. Seth Holt was also responsible for the impressive editing work in Karel Reisz’s seminal British film Saturday Night and Sunday Morning (1960). While watching The Nanny I was extremely impressed with the way Holt managed to subtly weave important themes found within the best films of the British New Wave such as the effects of poverty, class divides and youth rebellion into a Hammer horror film. Even though The Nanny could be viewed as a simple thriller about a tormented and troubled child being pursued by a psychotic nanny, underlying that is the complicated background of the nanny herself who was forced into a life of servitude do to her status and background. Her position in life has dire consequences for her own family as well as those she works for. During the film the audience is given the opportunity to sympathize with Davis’ character who is obviously deeply disturbed. This is an incredibly adult and modern approach to take in any horror film about a potential child killer even by today’s standards. 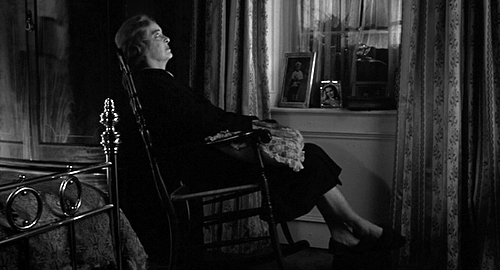 In an unforgettable scene that takes place in a poor British neighborhood clearly suffering from economic and social conditions that plague the lower classes; Bette Davis is forced to confront her past and the death of her own daughter due to a horribly botched back-alley abortion and we watch her quietly fall apart. Unlike the wealthy mother of Joey who lost her own daughter and now relies on the nanny to groom her and feed her, Davis’ character has no one but herself to rely on. In her pain she turns inward and clearly doesn’t like what she finds there. In her psychotic state she ends up cruelly lashing out at the most vulnerable thing she can, an innocent, wealthy, sheltered and pampered little child that she’s been forced to care for who will never know the kind of economic disparity that she’s been struggling with her entire life. 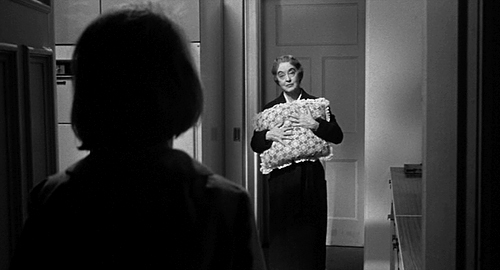 Davis’ last Oscar nomination was for her role in What Ever Happened to Baby Jane? and it’s often considered her greatest role of the sixties, but in my opinion her greatest achievement as an actress during that decade might be found in The Nanny. 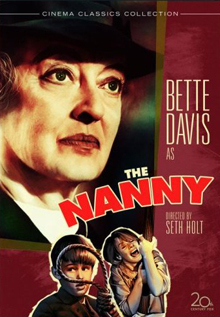 As I mentioned above, The Nanny is available on DVD as part of the 20th Century Fox Bette Davis Centenary Celebration Collection, which is now selling at Amazon or you can purchase The Nanny individually. The film has been beautifully restored by 20th Century Fox and it really looks terrific. The DVD also comes with some nice extras such as poster, stills and lobby card galleries, TV spots, the original trailer and restoration comparisons. The Nanny should also be available for rent online at Greencine and Netflix. If you’d like to see more images from the film please see my Flickr Gallery for The Nanny. 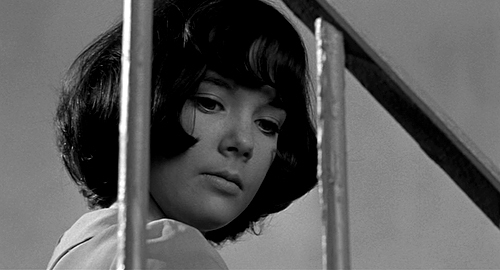 I actually tried to watch this once because Pamela Franklin was in it – she was quite the little number at one time, and I thought she would really go places in film rather than TV – but the tape I rented jammed halfway thru, so I’ve never seen it all the way. Not sure I’ll pony up for a DVD, but I’ll keep an eye out for it, mebbe. I remember Seth Holt mostly for directing the interesting Richard Johnson spy flick, “Danger Route”. I think I might have vaguely heard about this film at some point, but I’m really not familiar with it. Sounds like something I would really like, plus I’m wanting to see more Bette Davis. Great review! I totally agree that this is a memorable and subtle psychological thriller due to great work by the underrated Holt and Davis. I think this is indeed the best of her 60’s performances, maybe my alltime favorite of her career. As you say, all the more effective for being so understated. I saw this last over 20 years ago and still remember almost every shot. Holt always seems to know where to put the camera. I wish I could see more of his work. I saw The Nanny on cable, but missed the ending. I am hoping Holt’s other films get DVD releases. His last film, Blood from the Mummy’s Tomb is pretty good. The one I really want to see is Station Six Sahara. I was a just entering my teen years, and nothing seemed sexier than being alone in the desert with Carole Baker. I never saw the film, but the preview certainly got my attention. It was kind of a hard film to write about. I didn’t want to give away all the plots twists, but it’s kind of impossible to write about the film without mentioning that Davis’ character is trying to kill the young kid. I tried to avoid mentioning some other important aspects of the the film and the way the events played out but it was tough. On a side note – if you’re not afraid of spoilers you can read some brief thoughts I shared about the film over at The Horror Blog this week. Holt is an interesting guy and it’s a shame that he died so young while making Blood from the Mummy’s Tomb, which I like a lot. Station Six Sahara is one Holt film I’d really like to see since I’ve read some good stuff about it. I really wish more of his films were easily available on DVD. Nowhere to Go really should be made available as well as his terrific Hammer thriller Taste of Fear. I just saw the film last night in a rather splicy 16mm print as a midnight movie at a local microcinema. I have a question about it (possible spoiler): The movie made a big deal of showing us the nice big letter J the nanny puts on Joey’s steak-and-kidney pie. In the DVD, does it show Joey putting the J on a different pie in order to escape poisoning? I’m just wondering if a scene was clipped out of the print I saw. There is multiple reference made to him messing about in the kitchen, and I realize the movie wants to keep us in the dark about whether or not Joey is delusional, but the focus on the J makes me think that it *must* be addressed at some point in the movie. I do love the movie, although the ending seems a little tone deaf. A note about The Anniversary–Davis passed on doing it, until Jimmy Sangster took the original script, drastically reworked it, and resubmitted it to her. I’m sure we saw the same print of the film. I believe that the brief focus on the “J’ or letters that the nanny was placing on the pies was just to let viewers know that she was planning to use the pies to poison someone and she needed to keep track of which pie had the poison in it. Of course it ended up being the pie eaten by Joey’s mother. The nanny wanted the doctor to believe that Joey had poisoned his mother. She seemed to hope that Joey’s mother would end up in the hospital so she could be alone with Joey and kill him while he slept. Her plans got messed up though since Joey refused to be alone with the nanny and demanded that his aunt come over to watch him. I’ve been out of the loop the last few days so I just caught this post. I’ve wanted to see this for a long time so I’ve skipped over some comments and didn’t read too much of the post because I didn’t want anything spoiled. I love Bunny Lake is Missing (which I just mentioned recently) and can hardly wait to see this. Bunny Lake is Missing is a really terrific film and I think you’d find a lot to like in The Nanny too so I hope you can give it a look soon Jonathan. I know you’re a Davis fan yourself so this is a must see! I’m definitely going to have to get this one. I haven’t seen it in ages. I loved it. I’m glad to see that it holds up. I always hate when films I enjoyed as a kid aren’t as good to me in a viewing today. I love Bette Davis. That woman could be quite frightening. I love a lot of the films that she did. Some of my favorites are those that she did in her later years and were more low budget. I love BD – never knew about this film. I’ve absolutely got to watch it! I’ve had a posthumous crush on the late Jill Bennett for many, many years so I’m looking forward to seeing this at long last. did you know that Wendy Craig starred as a nanny ( a nice one ) in an 80s BBC drama series called “Nanny”?